Wild ancient revelry moves to the resounding beat of Korea’s past in “Dulsori,” roughly translated as “heartbeat of the land,” which since 1984 has brought the rhythm of Korean festivals to audiences in 50 countries. To mark this journey, which has taken the show’s performers to destinations as diverse as Belgium, Cambodia and Palestine, Dulsori will stage a three-day extravaganza in central Seoul. Its members hope to bring home some of the appreciation for traditional Korean song, percussion (samulnori) and dance they have received around the world before embarking on their next tour in South America. Although regulars at festivals here, this will be their first big theater show in Korea for many years. “Well Wishing Binari,” symbolizing blessing and hope, with ten performers instead of the usual seven, is distinguished by its crashing drums and captivating dance, embracing the audience as Asian culture embraces the idea of community. Unlike “Nanta” and “Jump,” both hugely popular non-verbal performances abroad and in Korea, Dulsori has primarily had its success abroad, particularly in Europe where there are many cultural exchange programs. “It’s very sad, this is not popular in Korea,” said the group’s domestic manager Tony Kim. “Korean people don’t like traditional Korean music.” With the special Yongsan show, Kim hopes the group’s vibrant, energetic performance will win them some more Korean fans. In an interview with The Korea Herald at their Hongdae studio, he admitted that even he was not open to such sounds until he met Dulsori. The former actor had been swept up in the all-powerful, Americanized wave of modern music and K-pop, like many young Koreans. But everything changed when he interviewed for the position as the group’s manager. “I fell in love with their music when I saw it (the performance) for the first time. I couldn’t keep my mouth closed. “I couldn’t forget the big drums’ beat. When I first heard it my hair was standing on end,” he explained excitedly. For him, the show’s sound represents yin and yang ― the big, strong beats of the drums, contrasted with the soft, calm sound of the “sanghgwang,” a rare multi-piped wind instrument often made from bamboo. So what makes Dulsori special? Kim believes it is the members’ youthful energy and raw talent ― often captured at its height as most are hired fresh from performance arts schools. “Dulsori is alive,” he said. He feels that some other shows in the genre sometimes lack emotion, but Dulsori’s performers have a clear love for what they do which resonates in the spirit of their performance. Although Dulsori’s members are only paid modestly ― it is a government-backed enterprise ― they work fulltime, which means six days a week, often late into the night. But with a very small market to enter for those graduating from performing arts schools, Dulsori has the pick of the country’s most talented performers. The show is not a fusion performance as other shows of a similar ilk are. It is a truly Korean experience, from the traditional instruments to the folk costumes, which Kim hopes people here will appreciate more as the popularity of Korean culture abroad is increasingly felt at home. This doesn’t mean Dulsori is not prepared to adapt and evolve however. “We’re constantly making new shows and changing it (the performance),” said Kim. The group is keen not to become complacent, despite rave reviews abroad from the New York Times and the U.K.’s Guardian newspaper after playing huge international festivals such as WOMAD (World Of Music Arts and Dance). As much as they enjoy traveling the world and collaborating with artists from other countries, eventually the group hope Dulsori ― principally viewed as a festival performance here ― will have its own theater in Korea. The group’s director, Moon Kap-hyun, one of the original members of Dulsori who is still very involved, is experimenting with ideas such as the use of special effects to help make their dreams of having their very own stage a reality. In the meantime, their manager will continue to be their No. 1 fan. “I will be the biggest supporter for Dulsori, just because I love them, I love their music,” beamed Kim. Dulsori’s “Well Wishing Binari” show plays at Theater Yong in Yongsan, Seoul, from June 24-26. The Friday performance starts at 8 p.m. and both the Saturday and Sunday shows begin at 5 p.m. A regular ticket costs 40,000 won, with VIP and special rates available. For further details and to purchase, visit www.theateryong.or.kr or their Facebook page at www.facebook.com/DulsoriBinari. 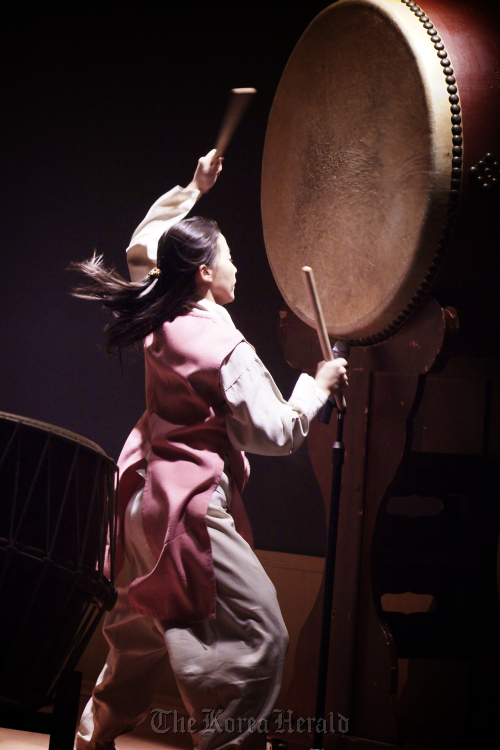 For more information on Dulsori workshops in traditional music and movement, visit www.dulsori.com or call (02) 744-6800.